If a homeowner is unable to complete repayments on their mortgage, they may be forced to default on the loan. If the owner defaults on the mortgage for a given number of months, the bank that originally loaned the homeowner the money to purchase the property can legally repossess it and take ownership of it. At this point, the property is referred to as a foreclosure or real estate owned (REO) home. The bank’s primary objective at this point is to recover as much cash from the loan as they can as opposed to accumulating real estate assets. As such, they will be motivated to sell the property as quickly as possible. Some homeowners take out a Federal Housing Association (FHA) insured mortgage. If the owner of a property that is backed by an FHA-insured mortgage defaults on loan repayments, he or she exchanges the property for an insurance claim payment through the Secretary of the Department of Housing and Urban Development (HUD), the Federal agents that manages national policy in this domain. Properties that have been traded in this manner are referred to as HUD homes. Homeowners who are unable to meet mortgage repayments and who do not have an FHA-insured mortgage will lose their property to the bank, which will subsequently sell it. Both banks and the HUD will use the services of a private operative to sell the property on their behalf. The HUD refers to these contractors as management and marketing (M&M) contractors or asset management companies. These companies will also subsequently subcontract the sale and maintenance of the property to a third party, usually a realtor or local service provider. During this program, the companies that sell properties on behalf of the banks and HUD will be referred to as asset management companies (AMCs) or M&M contractors. As this program progresses, you will be taught the methods you can use to identify key AMCs, form productive relationships with them and position yourself as a key contact with whom they trade business opportunities. In addition, you will also learn how to identify and develop a network with the realtors who are awarded the REO listings. Forming effective relationships with such realtors will provide you with a further opportunity to secure profitable work. It is important to note that not all banks sub-contract the sale of foreclosed properties to AMCs. Some will have an in-house REO department that will manage property preservation services and asset management. In these cases, the REO department will be responsible for sourcing cleanups and preservation work and for paying subcontractors for any work performed. A foreclosure auction is just what it sounds like — an auction to sell a house that has been foreclosed on. You may have seen people on the HGTV channel who flip houses going to these auctions and bidding on foreclosed properties. Well, property preservation and REO businesses also deal directly with these foreclosed houses. At a foreclosure auction, the bank or lender who owns the property is not allowed to profit from the auction, and the properties are often sold at a loss. Any profit goes to the homeowner and any other liens that are present on the property. If the foreclosure auction doesn’t work, and the property doesn’t sell for any reason, it automatically becomes an REO property. Why Don’t Foreclosure Auctions Always Work? This means the bidding price on the property could be a lot more money than the property is worth in a soft real estate market — in which case the bank or lender ends up with a difficult-to-sell property, and then an REO property. How Do Banks & Lenders Prepare REO Properties? This section will provide a brief overview of each of these money-generating functions before we progress to examine them in more detail in later sections. We said you could make money, but we never said it was going to be easy. 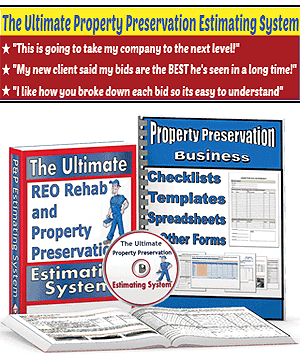 If you enter into this form of REO business, you can expect to get your hands dirty… perhaps very dirty. You have been warned! Quite often, foreclosed properties have been neglected and/or abandoned. Businesses that operate in the cleanup domain are literally sent in to pick up the pieces, and it isn’t always pretty. However, here’s the deal: because cleaning up repossessed properties is so undesirable, it is also very profitable. You may even make enough money from it that you can skip the cleaning part yourself and pay someone else to do it on your behalf. So what does a typical day in an REO cleanup operation actually look like? Well, first off, you should put any notions of a typical day right out of your head. Expect every day to be different and be prepared for all eventualities. By the time you’re called in to survey the property for the purposes of producing an estimate, it may have been empty for quite some time. It is highly likely that the people who once owned it will have known they were on the verge of being kicked out long before the enforcement officers showed up, and some of them will have been so hacked off at the prospect of being forced to hand over the property they may have purposely damaged everything in sight. You can expect the condition of a foreclosed property to range from mediocre to disgusting. Unfortunately (or fortunately depending on how you look at it), the majority will fall into the latter category. Luckily, this can mean big bucks for you. Should you win the contract to clean up the property, you will probably start by cleaning up any feces (yes, it does happen) and rotten food, taking away abandoned pets (that too) and empty the house of all property, belongings and rubbish that the previous owners left behind, both inside and out. You’ll then be required to give the place a good cleaning. The cleaner’s role is not to make the place showhome worthy by washing windows, ironing curtains, scrubbing carpets, etc. It is to give the house a once-over and ensure that it is in a good condition. Sometimes, this will also involve mowing the lawns and trimming shrubs and bushes. Unfortunately, you may not always have access to a water and/or electricity supply and, in such circumstances, you will be required to provide these yourself. After the clean comes the makeover, and, here too, you can offer your services and run a tidy profit in the process. Your customers will typically be banks, the HUD, realtors, and even investors. In many cities, local governments operate bylaws that specify that REO properties must be kept in a secure and good condition, both inside and out, at all times. Failure to do so can incur penalties of up to $1000. As such, it’s in a lender’s/bank’s best interests to make sure the properties they own are kept in good condition at all times. The organization or entity that initially loaned the buyer the money to buy the home (the mortgagee) will be held responsible for maintaining it, regardless of whether the property was FHA-insured or not. In the case of an FHA-insured property, the mortgagees will have been pre-authorized by the HUD to spend a given amount of money on such maintenance work. We’ll talk about this in more detail on Day 5. If no FHA insurance was in place, the mortgagee or the people they appoint to manage the property on their behalf will set their own budget. Responsibility for preserving and securing REO properties is commonly allocated to an asset manager who works at the bank or is sub-contracted out to an asset management company (AMC) or M&M contractor. These groups or individuals will be tasked with reviewing the initial inspection report that the realtor or the realtor’s preservation company has published, and making the decision as to what aspects of the property should be restored and repaired and what should be replaced completely. They will also set a budget for the work and manage the tender process by which interested contractors bid for the opportunity to complete the project. Once the work is complete, they will also inspect it to ensure it is of an acceptable standard and will, ultimately, pay any invoices (we’ll discuss the important aspect of payment in a later session). In some situations, a realtor may have identified a preferred partner with whom they subcontract preservation work to as standard. If you haven’t already figured it out, you want to be that preferred partner. If you are able to develop a close working relationship with a realtor who is frequently required to manage REO properties, you will have a chance to completely bypass the bid process and secure ongoing work. In the event that an investor has already purchased the REO property but is looking for someone to do the preservation work on their behalf, you will provide any quotation directly to them and liaise with them to complete the work. Again, its useful to track down individuals who make a living from flipping REO properties and trying to work your way into their good books. The work that property preservation companies complete falls under two broad categories: securing and preserving. The duties you will complete as part of these roles are detailed below. Some states require contractors to obtain a formal license before performing some of the tasks listed above, while others allow basic handyman services to be completed providing the cost doesn’t exceed a pre-determined amount. The process by which you can establish whether you need to secure a contractors’ license will be covered in more detail later. In times of recession and downtown, there are a large amount of homes available for sale on the market and very few buyers. This makes property difficult to sell and means that foreclosed homes will be on the market for longer periods of time. To stand half a chance of selling them, banks and the HUD need to ensure that they are kept in good condition and maintained on a regular basis. This is where you come in. Maintenance services involve a large number of tasks but typically include ensuring the interior and exterior of a property is kept clean and in good condition, maintaining any pool and outside areas and generally keeping everything in good shape. Providing these services can be lucrative because they are required on a monthly basis, giving you a steady stream of income. What’s more, if you were awarded the services to do the initial clean up and fix up, and you did a great job, you’ll have more of a chance of winning this ongoing business too. For this reason, when you prepare any quotation or bid for cleaning and/or transformation services, ensure you also include a section entitled “Optional ongoing maintenance services” in which you list tasks you are able to complete on an ongoing basis. Another top tip is to list “Optional decorating services,” “Optional repair services,” or similar. Sometimes an REO property can be on the market for a long time before the bank makes the decision to invest some additional cash into it in a bid to lure buyers. If you’ve planted the idea that you can provide painting and decorating services, you may also be given a chance to earn cash for interior decorating. Basically, you should ensure you take every opportunity to upsell additional services; you never know, you may just be taken up on them. 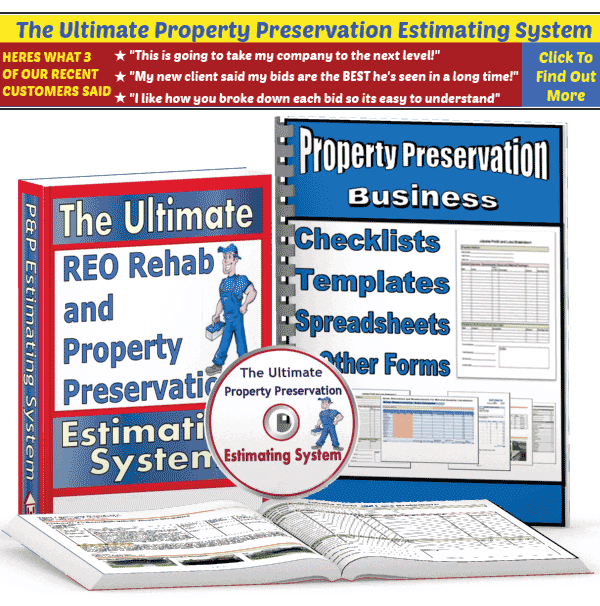 How Do I Find REO Properties that May Need Property Preservation Businesses? First of all, REO properties are not always listed cheaply. Lenders and brokers decide on a fair price through market research, so while REOs may be cheaper than the standard, they won’t be dirt cheap. Contacting lenders in your area directly is a great way to drum up property preservation business. How and who do you contact in order to get qualified to get the job of foreclosure home. I have the business but no good contact yet! There’s plenty home out there., but need good reliable company to work for. Some company just want to work you to death and not pay you when the work is completed. I have a good team and willing to do the job for the right amount of money. Looking to work with HUD And VA foreclosure. Clean out , Trash out, Garage clean out, for commercial, Residential. And Real Estate Properties Photography (Before & After) of all properties.